Consequently, I have a New Goal: Get Wethersfield done by November 9. Now, that may not seem like that ambitious a goal - we're only talking 18-19' of layout, 18-24" deep. 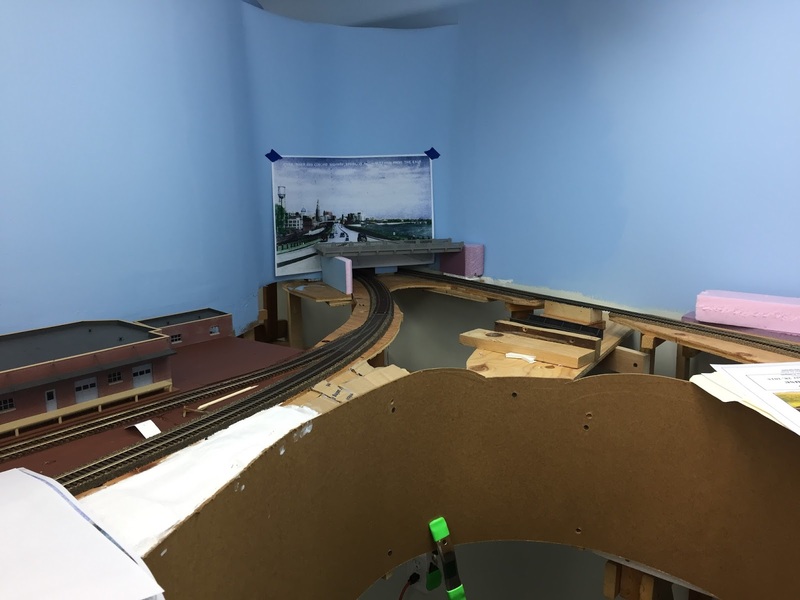 But this area has been hanging around in various stages of UNfinish ever since I started the layout in the Fall of 2011. I've worked on this area in fits and starts over the years, but getting it to at least a level of "done-ness" will be quite an accomplishment indeed. The south end of Wethersfield is defined by Goff Brook and the bridges there. Bill had been working in that area and it's a little complicated there anyway. So I decided to make some progress at the north end of the scene, which is defined by the Route 15 overpass. 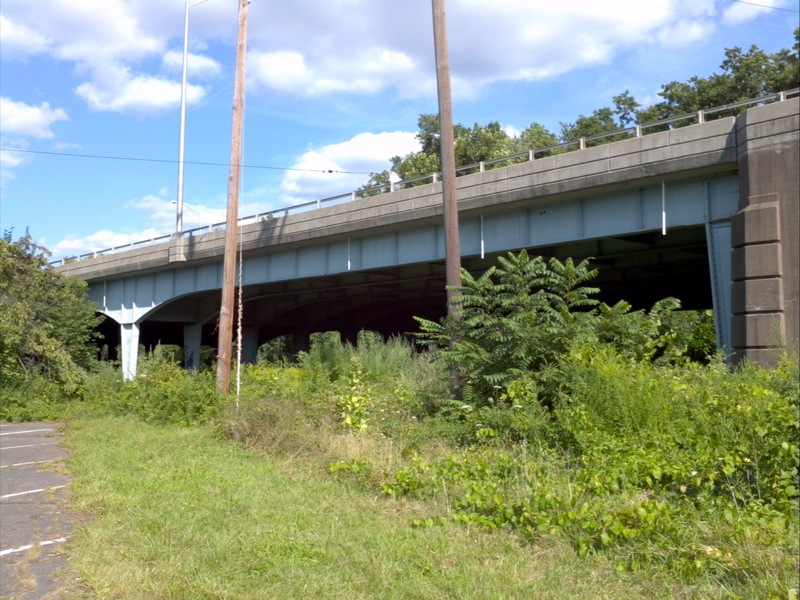 In addition to the backdrop challenges at this location (which may be on the way to a solution), modeling this overpass has been a major roadblock. I can see (in my mind's eye at least) how I'd go about doing it, but the skills - not to mention the materials - have been elusive. So this area has laid dormant - literally for years. However, that's all about to change. Along with my new-found motivation, I'm deciding more and more that I should not make the perfect the enemy of the good. 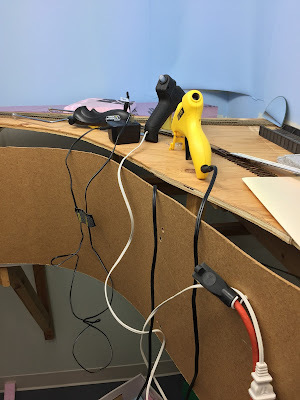 While I have high personal standards for my modeling (and do pretty well, provided I have enough time), I'm confronting the fact that I simply can't maintain that standard throughout the entire layout - at least not initially. Allowing myself to do "good enough for now" gets me a step above mock-ups, and a step WAY above plywood alone. And instead of plowing through doing the "perfect" scene (which in reality almost never gets done), I'm becoming more comfortable with doing things in "passes." Not only does that relieve a lot (or all) of the perfection pressure (and its cousin, analysis paralysis), it gives me the freedom and comfort to try things I might not have otherwise - and I've discovered that's where a lot of the learning happens. So, despite knowing how the prototype Rt. 15 bridge actually looks, I'm doing a "mid-level mockup" for now - something that's truly a model, but only a stand-in which hopefully conveys the impression of what's supposed to be there until I get the time/skills to model it perfectly prototypically. 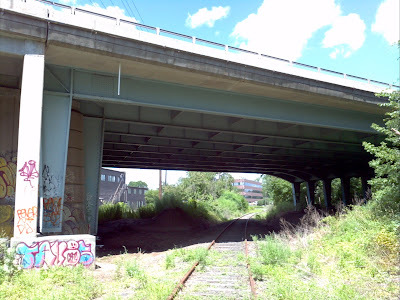 The scene above is pretty much the same as it's been for years - just a lowly Rix old time concrete overpass on blocks (with the Hartford skyline postcard tacked up for a temporary backdrop). 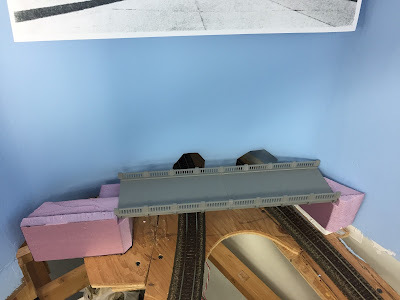 Unless/until I scratchbuild the steelwork/piers, that Rix bridge will suffice for now - supported by foam blocks carved to look like a reasonable facsimile of the concrete bridge abutments in the prototype photos (lines still need to be carved in and paint still needs to be applied). Certainly not perfect, but getting there. 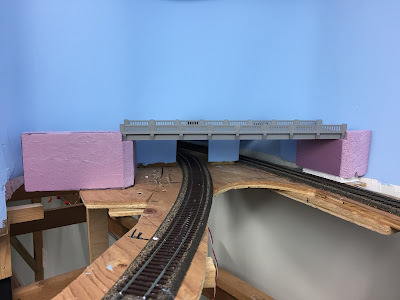 I plan to glue sections of sheet styrene at the ends of the bridge and on top of the foam to form the rest of the road. Tools of the trade - 2 different hot glue guns, a Woodland Scenics wire foam cutter, and steak knives (off scene). LOTS of trial and error (and glue) was needed - not to mention time - but at least the Rt. 15 overpass is further along now than it was before, and I've taken the first step on what I hope isn't quite a thousand mile journey! For what it's worth (not much probably) it looks to me like the prototype bridge was built after your year, so I think going with Rix is perfectly justifiable ... do you have any documentation of when the bridge was built? According to this site (http://www.kurumi.com/roads/ct/ct-chrono.html) looks like December 2-3, 1942. 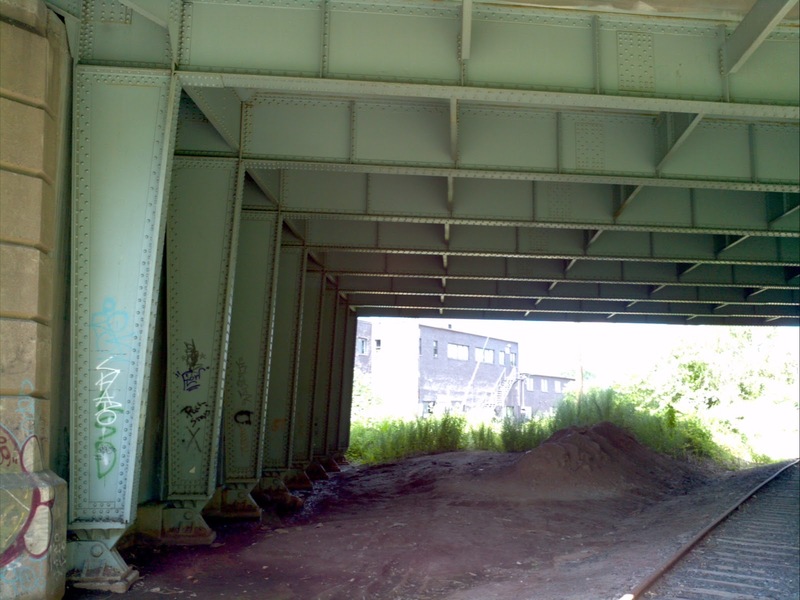 Having walked under this bridge hundreds of times during my youth I can confidently say that its appearance has not changed at all since 1947. Much deck work was done a few years ago but it didn't change its basic appearance.